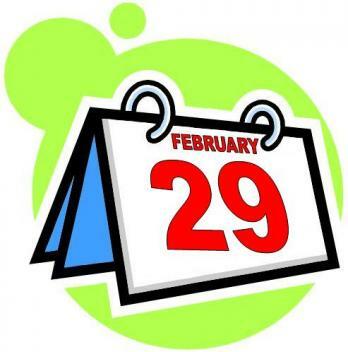 Today marks down the leap year day, February 29. Instead of 365 days in a year, 2012 has an additional one day. Leap year (day) is one of the day out 366 that full of superstitions. Personally, I don't believe in superstitions but just for fun here are some of the commonly superstitions that usually practice in some countries during February 29. 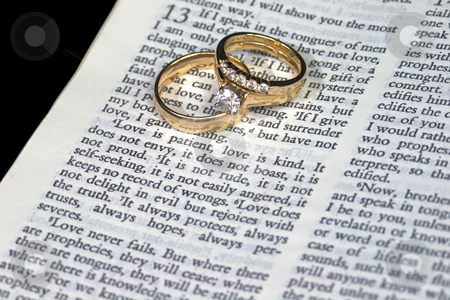 Women proposed marriage to their men. If you watched the movie "Leap Year" then you'll know the exact scenario. Usually woman in a long term relationship do this. I can't imagine myself doing a proposal to marry me; even you're in a long term commitment with your boyfriend I think he has a reason why he don't ask you yet to get married and whatever reason it is, you need to find it out. There are some guys who are just zipping their lips and not to brought out things but deep inside they want to be out in the relationship - I'm not talking in general, of course there are some that not yet really ready for a married life. So if you're one of those ladies who are in the LTR, and waiting for a proposal from your boyfriend, instead of proposing for him to marry you, just talk to him and directly bring out your concerns about your feelings and expectations. Another note, long years being in that relationship is NOT an assurance that you'll end up together. On the other hand, I know so many successful marriages that they stayed as boyfriend-girlfriend on for few months and got married after. Years being together is not really a basis for a long lasting relationship. Leap day is consider also as Bachelor's Day. Men are expected to pay penalty such as gown or money when they refused the marriage proposal from a woman during Leap day. Well, men beware! what if that woman just want a new dress or money and the easiest resource is you. but although we don't have that kind of practices there is a semi counter part that we called "pikot" or seemingly shot gun wedding. I say, no shut gun wedding will be held, if the man doesn't do anything or caused anything for him to force to marry the woman. Guys, if you doesn't really love the woman don't play her feelings; don't put false hopes to her; don't make promises either because maybe in the end you'll pay for it. As I heard one of my friend "digital na ang karma, sometimes wala pang 24 hours bumabalik na". For some other countries like Scotland and Greece, leap day is unlucky day just like Friday the 13th, but for me it is an additional day - a day full of blessings that needs to be thankful of. Let's make this day a worth remembering day - an additional day in a year that was given to us to enjoy and give our best to have a blast. And by the way its Wednesday ^_^ my favorite day! People who I've been with for long time know my weaknesses; they know what makes me happy, and know one of the things that really bring joy once I have it - Mickey stuffs. I will be turning 3 decades and 1 year few days from now but the child within me will always be present. For others collecting cartoon character items is only for children but not for me ^_^ because until now I am still doing that and I guess I will continuously do it. 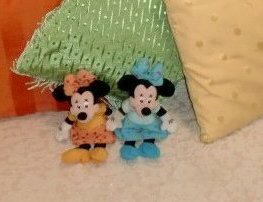 Its been more than a decade since I get hooked in collecting mickey mouse stuffs. I started buying some petty stuffs when I was in 4th year high school but mickey mouse is not the first, its tweety bird but because she is popular that time, you can see her every where and on my term "palasak"so I decided to shift to Mickey. I remember my Mom asked her officemate to even buy me a Mickey Mouse stuffed toy when she visited Disneyland. Its a Minnie Mouse actually - when I saw it I was really excited but what made me more excited is when I learned that the doll itself is just a free and what has been paid is the mickey head necklace on the doll's neck. I remember when my parents gave me a Mickey Mouse watch one Valentines day. A friend, Mike gave me a stuffed toy yellow Minnie Mouse bag (that's one of favorite among my stuffs) and I even using it in the school even I am on Junior college years. When I celebrated my debut (18th birthday) almost all of the gifts I received are Mickey stuffs - received a Mickey toothbrush from a friend, Connie. Got so many Mickey mugs also from Jona and some other friends. I owned so many Mickey Mouse stuffs that was all given by my loved ones and up to now I still have and treasured. Sayang I had no picture of those items with me but let me show you my room the last time I got home for vacation. 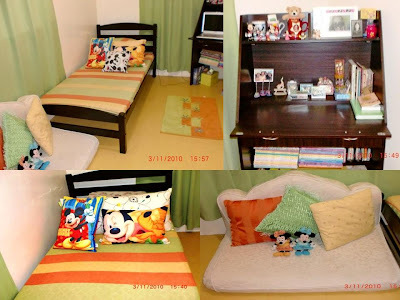 Some of my Mickey mouse stuffs were shifted to our guest room so my room will have a new look - lagi kasi napapagkamalan na kwarto ng mga nephews ko, kc mukhang room daw ng kindergarten ..hahaha. Some of Mickey stuffs I got from my friends and I am keeping some of these for years. The latest I've got is a Mickey notepad given by my cousin Sze an when she went to Disneyland Paris just two weeks ago. Few days from now I will be celebrating my 3 decades and 1 year existence and I am planning to have a Mickey Mouse theme party ^_^. It will be my first time to have a Mickey theme party if ever. For others they find my collection as "luho" but for me its just like any hobby that one have. As long as I don't compromise my other needs and not over spending beyond my money hand its not a "luho" for me. Collecting is one of so many ways on how I pamper myself - its just like craving and indulging over a piece of "sinful" cake. Almost every Mickey stuffs I have has its own story; every items I am keeping is from people who loves me and I truly value and love as well. Those things may be out of craze but the value of the people who handed to me those things will always be cherished. 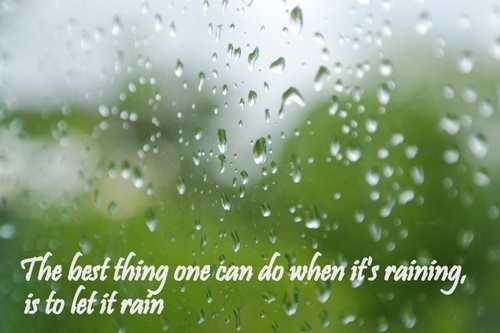 I am always mesmerized by rain fall. I get lost in the sound and sight of the heavens washing away the dirt and dust of the world. Memories of running, splashing as carefree as a child come pouring in as a welcome reprieve from the worries of my day. Its sounds are like a sweet voice on my ears that calms me. 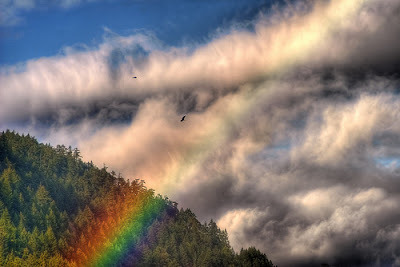 In life there will be rainy days – rain pours everywhere sometimes much more than that; a storm. Let just ran through it! Don’t be afraid to get wet, if God allow us to be wet, we just need washing. And after the rain off, we stood smiling and darting the past as memories. 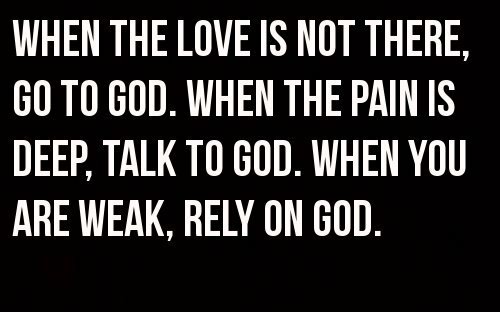 Don’t pray for the rain to stop, dance and enjoy through the rain as you continuously pray and trust that God will get you through it. The sun will always shines after every rain. So next time you experience rain, just enjoy it! Thank You for reminding me the first and greatest commandment as well as the second. That You alone will be lifted. Most of the special things happened to me on Wednesday. And SUPER ramdam na ramdam ko talaga ang love and care sa akin ng mga tao 'pag Wednesday. ALOHA Burger + orange fruit from Griselda a.k.a Ate Gidget. Thanks ate! PATCHI chocolates from Jane. She received Patchi chocolates from her husband and share some pieces of it to me. Thanks Jane! Another sets of sweets from Janet ^_^ Thanks Janet! Its Kuya Rudolf's day and its a lunch treat for SUPERFRIENDS! There are so many things to be thankful - simple things that may seems so plain yet full of love and thoughtfulness. I am thankful I am blessed with loving people who always makes me smile and makes my heart happy in their simple ways yet so special for me. Thank you for making my "happy Wednesday" more special. Few hours left and its gonna be what they called "HEARTS DAY"
For many, they are considering V Day as an occasion for couples or lovers only. But not all do; coz even when I still have a boyfriend I don't really go on a date on February 14, not because I don't want to celebrate hearts' day but because of some petty things, here are some that I usually heard from those couples/partners that don't usually go out on February 14. 1. In Philippines, matraffic pag February 14, masikip ang parking sa mga malls. 2. Fully booked ang mga restaurants or kung may makita ka man hindi naman yon ang prefer mong kainan. 3. 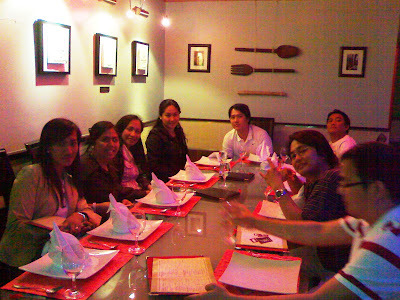 Usually there's a party / group dates sa office, so the many the merrier. 4. I am giving way to those na V Day lang ang chance nila to date so 'wag ng makipagsiksikan pa.
5. You never know kung sinong lovers/couple ang makakasalubong mo baka mamaya in not so good terms pa kayo at instead na compliment ang ibigay mo sa kasama nya e puro criticism ang ibigay mo. I am single for some years but I am excited every February 14 is coming. I am thankful that I have my family and friends who always extend their care and let me feel how much they love me. Every year there's always something to look forward on V Day and this year I know it will be as special as the previous years. Everyone closed to me knows that green is my favorite color so its not new for them to see me wearing in full green from my top to my accessories. Here's my self explanation: Green in the traffic light signifies as "GO" and red as "STOP". Singles are always on the go since they have no baggage to carry with them unlike the married ones that there are things to be considered - its either the wife/ husband and children as well. When the light is green you can take any chances and opportunities you have and since you are single you are free to go out with someone. I spent my 2008 V Day with friends as we celebrated the first birthday of my first inaanak in Doha named Aleexie. I seldom wear pink and I have only limited pink color of top, not because I'm not into that color but for me its too feminine and "nene". Pink in psychology is a positive color inspiring warm and comforting feelings, a sense that everything will be ok.
My 2009 Valentines Day maybe is one of the most memorable valentine I ever had. Ate Rebecca, the secretary that was given to me by my boss was diagnosed of breast cancer and was confined in the hospital that time. Instead of having something special for my self I chose to spend with Ate, to extend the care and to assure that there are so many people who loves her. I learned so many things from her when we are having our kwentuhan. I know even few hours I let her know that we really care & love her. March 16 of the same year Ate passed away. On our visit to Ate Rebecca at Rumailah Hospital with my colleagues & friend - Ate Bing & Jen D.
Contrary to what others say black for me is "flexible" color, I can wear it without worrying if it will match to other combination. Black is the color that can fit into any design to add contrast, and make the other color stand out more. Without any plan a colleague and friend Marvin just invited us a bit late for a dinner - just to celebrate together with our other friends - SUPERFRIENDS. A simple invitation became a fine dining dinner. 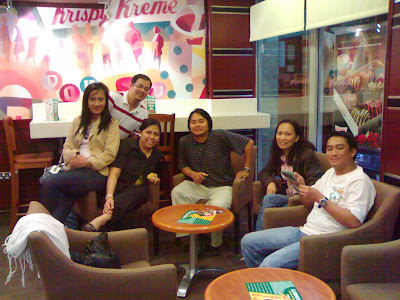 After the dinner treat by Marvin we started to drop others to their houses but when they saw the Krisppy Kreme outlet near our house we agreed to have coffee to end the night. Whenever I am wearing a printed / colorful top and people around noticed it I will promptly say "makulay ang buhay ....parang life ko makulay". Last year I was very busy and didn't plan anything because I know it will not prosper because of my workloads. And since my circle of friends in the office didn't organize any plan as well because of busyness, we decided to stay in the office. Its late already when my friends in the department decided why not to take late dinner in the nearest Pizza restaurant in the office. Gotcha around 9:30 p.m. we left the office and had our Vday dinner. Tired and exhausted from work but still relieved by each others comfort and of course by the yummy foods. Tomorrow is V Day and I'm still single - HAPPILY SINGLE . No worries on how people will start to tease me how can I celebrate it, all I know is I AM HAPPY and the love that I received from my family and friends is enough for me to have a great Valentines day. While I'm doing this post, one colleague told me "Valentines day bukas, sadness day na naman para sa mga singles" I interrupt her immediately, "of course not" because me personally I didn't experience to be lonely on V Day then she asked me how, I answered "I am blessed with family and friends who always let me feel that I am not alone and that somebody cares, loves, and comforts me. And when they are enough for me not to feel the coldness of V Day"
Valentines Day is for everyone; not only for the couple or partners but even for the single one. This is the day to enjoy your singleness having a group date - the many the merrier, the memorable! Make everyday a valentines day. Let people who closed to your heart feel that you care and love them. Make every moment with them special. Give love and it will be given to you as well. Have a great V- day! I love being with kids. I love playing with them, doing some stuffs with them, cuddling and hugging them. Their world seems nothing to worry - they can speak whatever they want not minding who is the person they are talking; they can ask anything they want without thinking if it will be given to them; they can cry whenever they want and easily pacified. Sometimes I am wishing and hoping I could be a child again but when I face the reality instead of being a child again why not to be a "mother like" to them. Last Friday, February 10, 2012 I was given a chance to be surrounded again by cute little angels. A friend and a former officemate of mine invited me to join on her son's first birthday, although I have no child as I am still single, she insisted not to miss the party. I bring with me Aleeza and Erika since I want them to enjoy their weekend outside the house. I am their guardian for the day - its sounds like easy to take care a 7 & 5 years old girls but its not ^_^. I don't have young sister nor any niece, I have two nephews but still little girls are still different especially in being fashionistas compare to a young boy who will just wear pants or shorts + t-shirts, shoes and that's it. One of the reason why I love little girls is the way they are dressed up...I find it really cute. another inaanak of mine, Danica wearing a tan color dress, glittery brown doll shoes and a pink hair band with butterfly that compliments to the color of her dress. She looks so dainty and "dalaga" on her dress. Erika (left) and Aleeza (right) preferred to wear a sporty outfit - shorts + blouse/shirt + rubber shoes. They look nice on it and they can really move easily as they played the game and go on the rides. 1. They are kids and they must be treated as kids. You must talk to them softly yet firm so they can understand what you're trying to say. 2. Be sure that before you leave the house, you already let them know and understand what are the do's and don't s on the place or occasion that you'll going to attend. 3. Let them sit with their fellow kids and encourage them to make friends with others. 4. Don't forget to bring with you some toiletries that they might need (wet wipes, tissue, hand sanitizers, etc). There's a tendency that they will mess up especially when they eat. 5. Allowed them to eat by themselves, in such a way they can learn how to be independent but still supervise them even in afar. 6. Allowed them to join in games, it will develop their self confidence. 7. Trust them to care themselves but still give them supervision. 8. Be patient. Bring with you a high dosage of patience. 10. Be a child like while you're with them but never be a childish. It's another charged to experience to be a "mother like" even in a few hours in two "kulilits". It's tiring but its happy and fulfilling knowing that I am a single woman yet I can managed to take care two "hyper" girls. I enjoyed so much being with them, looking forward to take them with me again on future children's party. And to all single men & women out there, I am encouraging you to bring kid/s (either niece/nephew, flatmates child,inaanak or whoever) with you when someone invites you to a children's party, trust me you'll enjoy the experience to be a "parent like". Parang nagOJT lang - thanks for the training kids!